The idea of confidence in women is always an interesting issue. Especially given the plethora of articles about women and cycling. And then I read Annabel Crabb’s article on confidence and I started thinking. 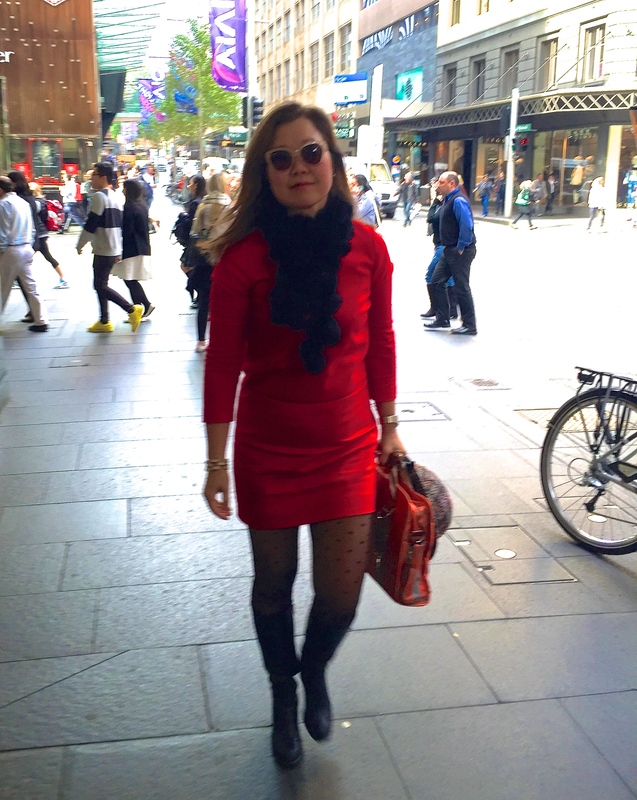 On my way to lunch in the warmth of Sydney’s late autumn. I love the spots on my tights! Stylish faux chicken pox. Seven years ago, I was about to return to work after the birth of our first child. Our daughter was a year old. My husband Justin had already started cycling to work. I had insisted that he buy a (stylish) fluoro jacket and he had complied. Why? 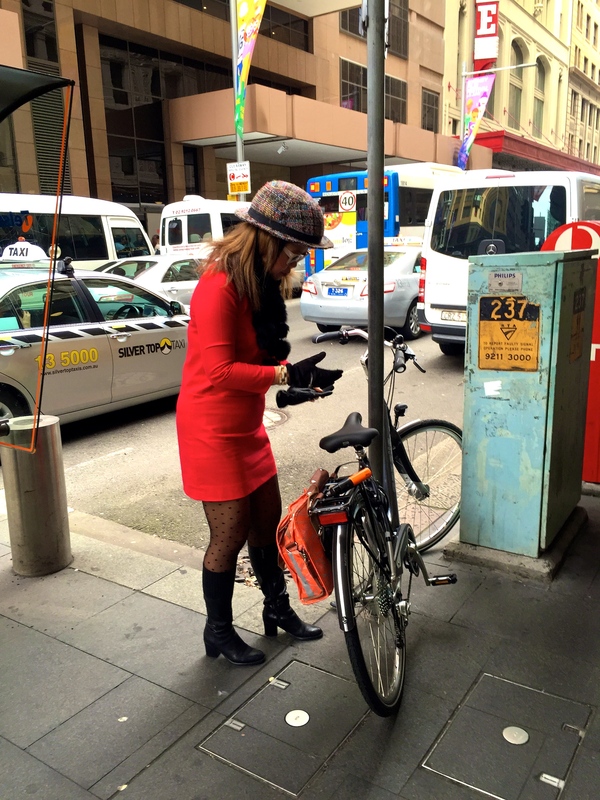 Because my perception of cycling in Sydney was that it was DANGEROUS because of the Traffic and the Drivers. 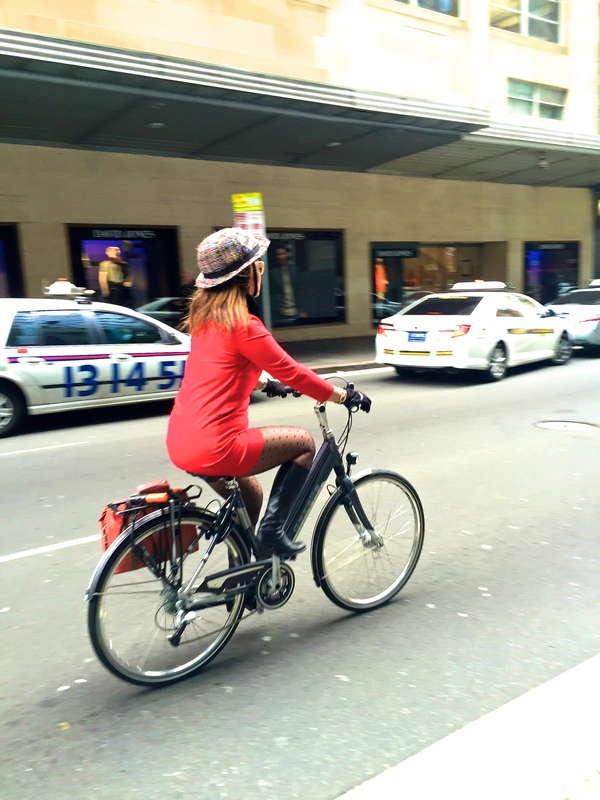 The Gazelle Ultimate T1 rides like a dream around the city. I started riding again in the parks when our daughter was nine months old, but not in heels and a skirt. 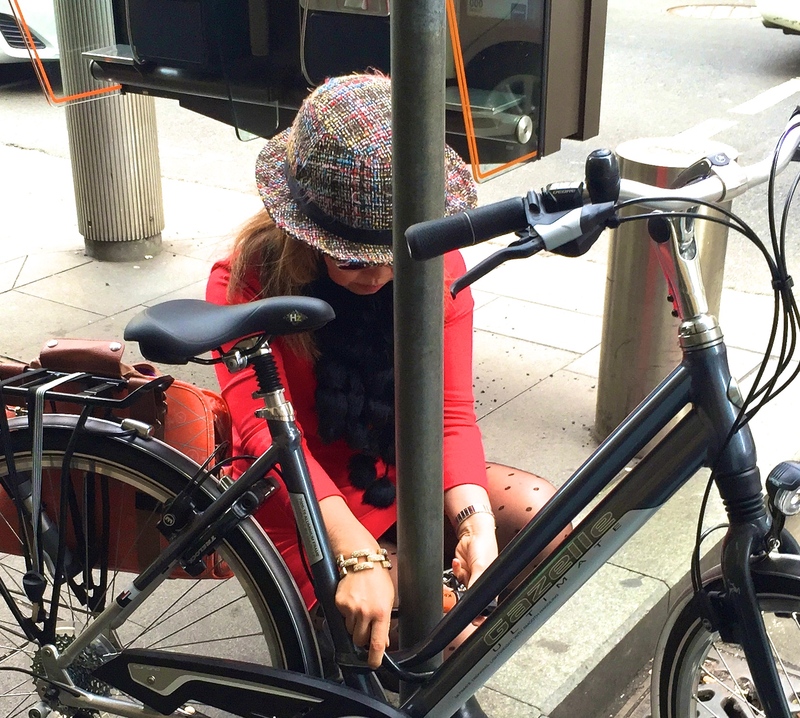 I was clad in cycling shorts and trainers with Ofelia helmeted and safely seated behind me. After riding in the parks for a few months, I wanted to take her to childcare on the bicycle a few days a week. I would continue onto work from there. It was the fastest and most efficient way to do both and I would be getting exercise as well. Gloves keep my hands warm while the scarf and boots help too. I organised a practice ride on the weekend before I was to return to work. It was a disaster. A hill start was tricky as the front wheel would rise when I was in the wrong position. The weekend traffic seemed aggressive. The fact that I couldn’t see behind me was terrifying. And when a car passed us, I nearly burst into tears. I was conscious of having our daughter seated behind me. Justin accompanied me and he kept telling me to breathe. He could see my distress. We made it to the city after cutting through the Botanical Gardens to get away from the traffic. The dress is superfine wool with lining and very warm. It also keeps me visible. I love this pavé cuff from J.Crew. When we arrived at my office building, I said, “I can’t do this.” I felt fear and anxiety during the entire journey. I also felt like a failure. How could I have misjudged this? I realised that I didn’t know how to deal with traffic. Unfortunately, I had no idea of how to educate myself. Looking back, I realise that it wasn’t the right time for me to start cycling. My mind was not open. I was afraid of the unknown. I was a new mother. I felt vulnerable. I’ve decided to grow my hair a little longer. It’s strangely easier to maintain. My Yakkay helmet masquerades as bicycle seat. How cheeky! The day that I returned to work, my manager, who had flown in from Hong Kong, informed me that my role had been made redundant. I no longer had a job despite having worked (probably too) hard even up to the last few days before our daughter’s delivery by cesarean. It was a blow but also an important lesson about my attitude to work. Six months later with some hard work, I had a new role with a better firm and a part-time working arrangement. Unfortunately, I would not change my attitude to work until after Julius was born but then I’m stubborn and wilful, like my daughter. Rounding the corner for some lunch. Seven years later, confidence has made it possible for me to ride every day into the city and with my children. It took time and effort for my confidence to grow on the bicycle. It started with my husband’s support about three years ago. We decided not to by a car. Instead, we bought the Nihola and installed an electric-motor conversion to be able to negotiate the hills in Sydney. 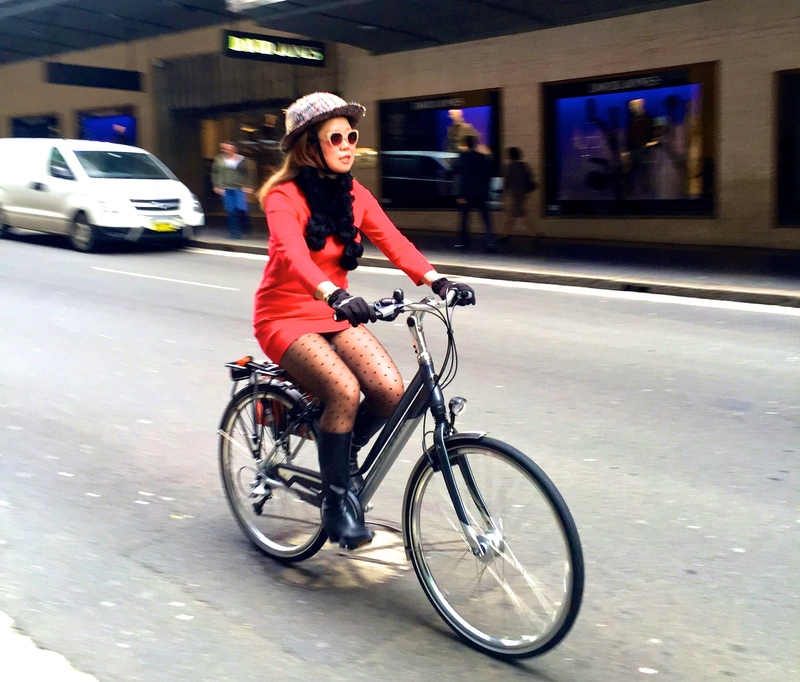 I took a four-hour course that the City of Sydney offered called “Cycling with Confidence.” The instructor yelled at me for being late to return from a break from the course. Why was I late? Because I had been breastfeeding my son. I didn’t care about his attitude. My son was more important. I took what I needed from this course, namely how to be visible, choose your path on a quieter road and show clear intent to the drivers behind you. 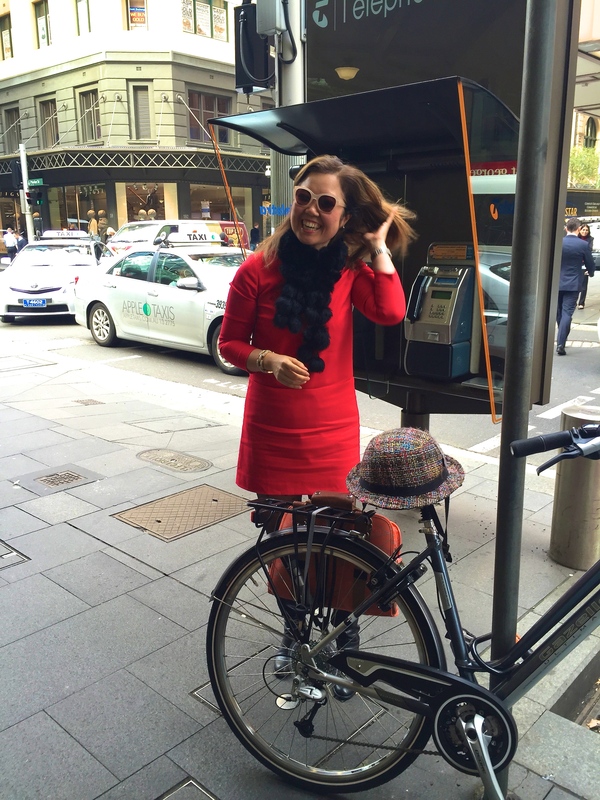 Because of the tricycle, I developed the skills to be able to cycle in the city and beyond. Because of my commuting skills, I also ride road and mountain bikes and do so while wearing lycra (gasp!). I believe that for more women to cycle, there needs to be support in many different forms as have been mentioned in these articles. But most importantly, I believe that in order for an individual to change, she or he needs to want to make a change. The rest will follow with resilience and patience. Today’s ensemble: J.Crew dress and cuff, Cartier Santos, Witchery sunglasses, Yakkay helmet, fake fur scarf, BBB gloves, Leona Edmiston Pins, Geox boots, Gazelle Ultimate T1 provided by Omafiets, Redfern, Po Campo Pannier Bag. Silly me… I thought that was illegal?? Ancient history now but I was offered a redundancy package which I accepted after consultation and the appropriate advice from an employment lawyer. No need to apologize on behalf of anyone! I’m Australian now too. It takes all sorts.